Veering OT again, off topic that is. I was supposed to write about my first pet. Since I have an absolutely horrendous memory, I don't even know what my actual first pet was. I *think* it was our cat, a Siamese named Ginger, but I don't know for sure. Then I thought I would write about the first pet I owned as an adult, which was my cat, Benjamin, but then I went searching through my blog about pictures and stories of him (how we ended up losing him was one of the most heart-wrenching things I've ever dealt with) and decided it was too much. I couldn't write about him here. Or maybe my first dog, Lily? Yeah, again, it was too hard to bring up those memories when I went searching for photos. So . . . I will share more workout stuff with you. How's that for skirting any sad feelings?! Instead, let's talk about pull-ups! Yee-haw! 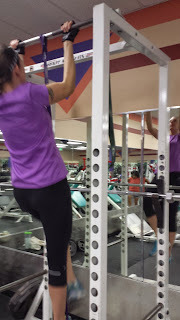 Remember how I have brought up my favorite piece of exercise equipment, which is a pull-up band, like, oh, about eighty bajillion times lately? Well, here I am bringing them up again! After doing a set of pull-ups err, chin-ups (just discovered today that what I do is a chin-up, not a pull-up) with the thinner band at the gym yesterday I was on cloud nine. I couldn't believe I was able to graduate to a thinner band-- only four reps at a time, but still! I did it! The band I was using was the green one, it is 1 3/4" thick, the next step up is the purple band, which is 1 1/8" thick. It is much harder to use, at least for me, and I am excited to keep progressing to the point that I can knock out 3 sets of 8 with this one . . . and then move down another band! My friend Sarah was kind enough to snap these photos in the gym today. When you use a band, you put one foot in to it, with the band coming around under the bottom of your foot at the arch. Then you wrap your other leg around the front, like crossing your legs. The other leg doesn't go in the band. When I was doing pull-ups chin-ups with this new band I ended up kind of hiking up my free leg to help boost me up to the bar. Hey, it worked! You pull up to the bar, then lower yourself. ALL the way. Straight arms people! Then back up! 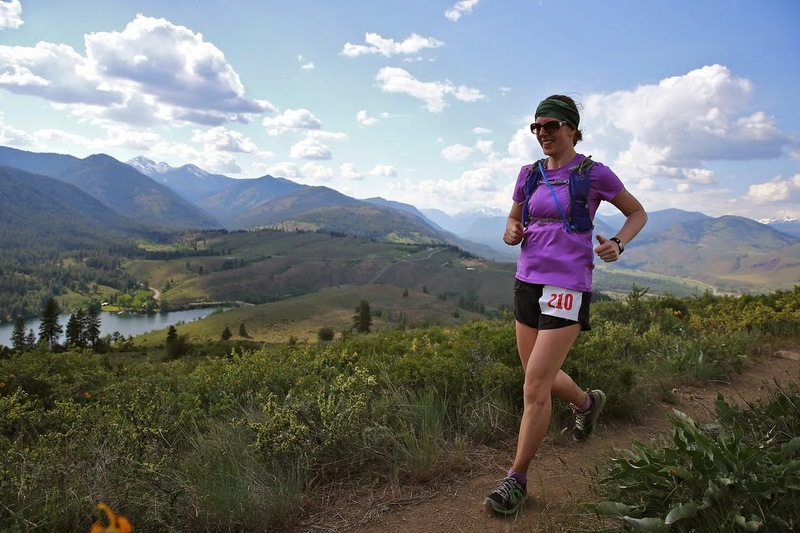 When you are done you reach with your free leg over to whatever ledge or bar or box or friend that helped you get up there, then take the pressure off the foot that is in the band by bending your leg, and slip your foot out. Voila! If you are at the gym with a friend and can't quite get up to the bar with the band, ask your friend for a boost. She can put her hand beneath the foot that is in the band and boost you up a bit. Not enough to launch you in to space, just enough to give you a teeny bit more assistance to get all they way up. If you don't have access to a band and want to try to work on pull-ups (or chin-ups), another good way to do them is to to do a negative pull-up (or chin up). 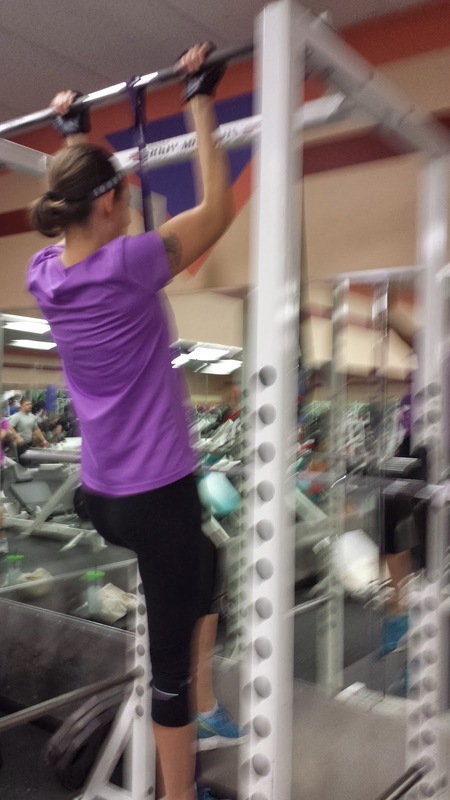 To do this, you jump and grab the bar, then SLOWLY lower yourself back down. Let the record show, I HATE doing these. 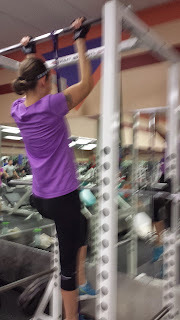 If you only have an assisted pull-up machine at the gym, by all means use that. 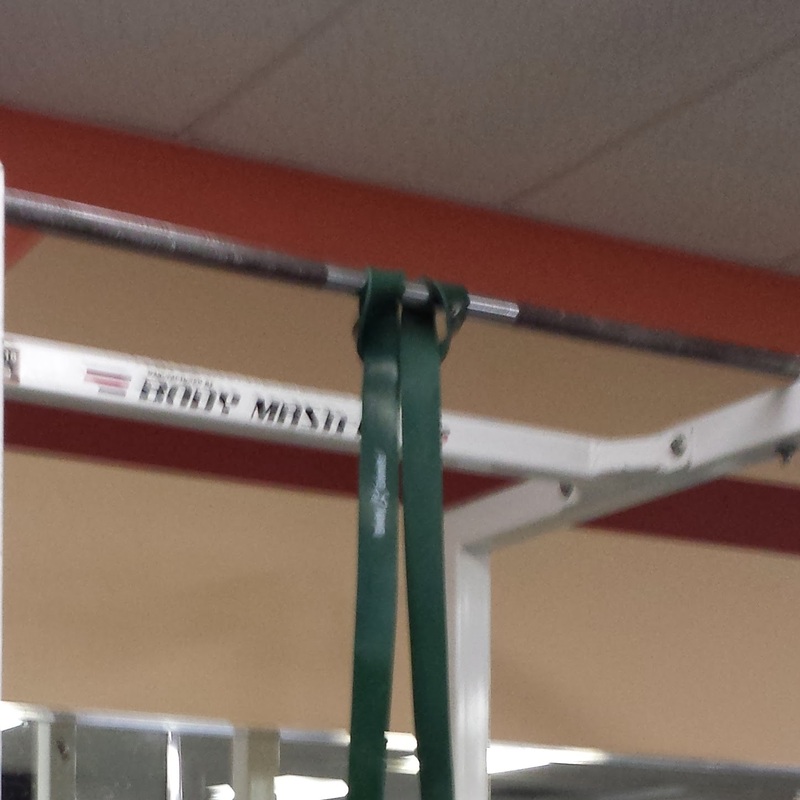 The one negative thing about those is that they don't really mimic a real pull-up. They give you constant assistance the entire way, and don't feel the same as going for a pull-up on a bar does. That said, they provide a great upper body workout, and if you aren't quite ready for pull-ups with a band, or negative pull-ups, then use the machine. Want more awesome tips about how to work up to a pull-up (or chin-up)? Check out this post on Nerd Fitness, it has a lot of great tips! What is your favorite piece of gym equipment?